So today’s recipe comes out of opening the freezer, opening the fridge, back to the freezer, over to the pantry and then back to the freezer 🙂 Turns out i had chicken breast or chicken mince. 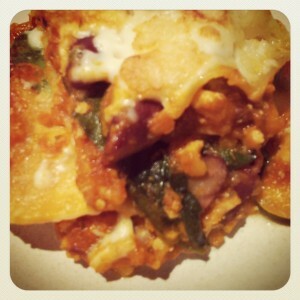 I had lasagne sheets and a whole lot of pantry staples. What better then a good chicken lasagne! I love lasagne it’s one of my favourite meals! What is better then left over lasagne for lunch the next day too 🙂 I love to add a heap of veg for the kids, we all love kidney beans and well I usually find a way to add baby spinach into pretty much every single meal. You could definitely add some fresh herbs to this meal or change the kidney beans to butter beans, lentils or just go bean free. I don’t usually add any salt into the dish if I am using the stock so I tend to wait to taste and add at the end of the cooking. Oh and if you have a second bowl and blade set this is the perfect recipe to make the most of them! 1 Batch of White sauce as per EDC recipe. 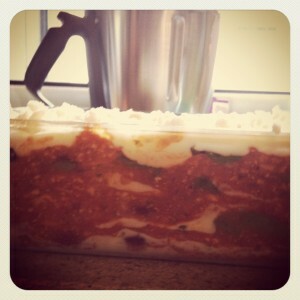 Grated cheese to top lasagne. I used a goats cheese. You can choose any cheese you like. 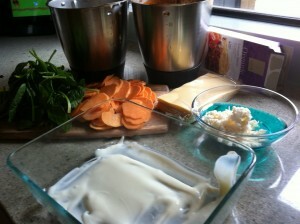 Even add a few bits of bocconcini across the top for an extra cheesy hit! Add Garlic and Onion to the TM bowl and blitz on speed 6 for 3 seconds. Add oil and sauté for 3 minutes Varoma temp speed 1. 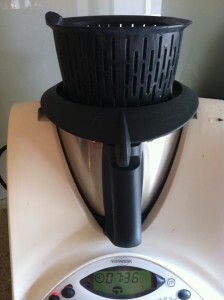 Add carrot and zucchini and blitz speed 6 for 5 seconds. Cook for 3 minutes Varoma temp on speed 1. Add Chicken mince and cook for 10 minutes Varoma temp on speed reverse + speed 1 with the MC off. Add Passata tomato, tomato paste, stock, and kidney beans and cook for 10 minutes, at 100 degrees on speed reverse + speed 1. You can place the basket on top of the lid in place of the MC. Lets the sauce Breathe, and also stops the splatter. So it’s up to you which way you assemble it. This is the order that I like to do it. Repeat until the top of the baking dish. Finish with a layer of pasta followed by white sauce and top with cheese. Bake in the oven for 30 – 45 minutes at 180 degrees. 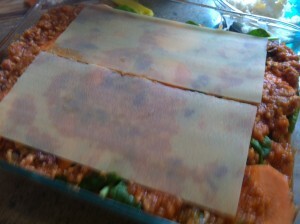 Use a knife to check that the sweet potato and pasta sheets are all cooked through. I always add a white sauce layer first to make sure the base doesn't dry out! I finish it with the pasta and then the white sauce, and finally cheese.